Learn how to download YouTube music playlist video to MP3. "Is there any program to download an entire YouTube playlist as mp3 files? I know the bitrate doesn't make much of a difference but since the memory on my computer can handle infinite amounts of songs, I'd prefer it to be able to download mp3's 320 kbs"
Now I think there are two questions here that are related but need to be elaborated separately. What is unclear to you is first of all how to download YouTube playlist to MP3 and then how to download YouTube music playlist as MP3 with the highest possible audio quality by adjusting bitrate, sample rate, etc, while the output size does not matter much to you. Specifically, as for people's concerns of downloaded YouTube songs, how to get a 320/256 Kbps MP3 YouTube music playlist? 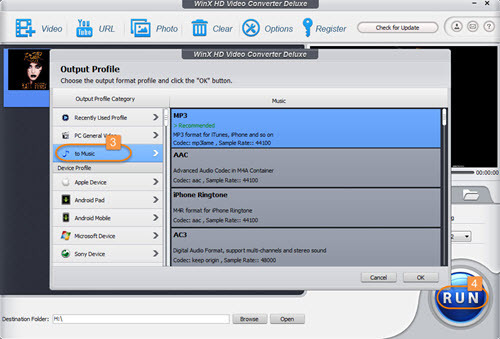 WinX HD Video Converter Deluxe is an all-in-one YouTube downloader and converter. Free download it now to download any playlist video to MP3 format at one go. - For who has converted YouTube music playlist to MP3 but need further editing, jump to this section. YouTube, with abundant and constantly updated collections of hot songs or top singles playlist, movie clips and trailers, educational videos, funny homemade videos, etc., should really be your first option to find your loved music playlist. It serves as the main source of entertainment for most people. But as we all know, YouTube offers no easy ways to download music videos or any other videos available on it, let alone download YouTube playlist as MP3. You might find links listed below aimed at downloading YouTube music playlist of some top 40 singles, kids songs playlist or Christian Gospel songs playlist. But I guess also you've already got familiar with things like "The download doesn't work, it says link deleted". #2 - How to Download YouTube Playlist to MP3? The answer is to get a professional YouTube music downloader. It is not the only option, but surely the best and easiest one. Here I recommend you one of those well-received YouTube downloader for music playlist to MP3 downloading. WinX HD Video Converter Deluxe, functioning as both HD YouTube downloader and video converter, is just the right tool for you to download and convert YouTube playlist to MP3 all at once. Step 1: Click "YouTube URL", copy and paste your music playlist URL to analyze it. Step 2: Choose one presented resolution/format/size/codec. To download YouTube playlist directly to MP3, never forget to tick the button "Auto convert". Press "OK" button and go on. Step 3: Select one output format. Here choose MP3 in "to Music" under the Output Profile. Step 4: Hit button "RUN" and start to download YouTube playlist as MP3. If you have special need of audio codec or other parameters editing, like downloading YouTube playlist to MP3 320/256 Kbps, follow the downloading guidance listed above till the step 3. After making sure that your YouTube playlist would be downloaded as MP3, click the button of output setting to do the adjusting, as shown in the picture on the right. 1. Click the wheel-shaped button to get into the output video/audio parameter setting section. 2. If you want to download YouTube playlist as MP3 with specific bitrate settings, move to the Audio Options part, and you are free to adjust audio codec, channels, sample rate and bitrate. Both sample rate and bitrate have effect on audio quality. Basically, the higher the sample rate is, the closer the output MP3 playlist is to the original one. 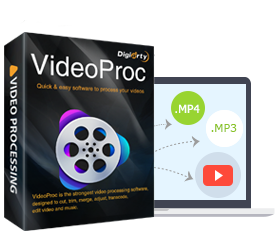 As the greatly enhanced successor of WinX HD Video Converter Deluxe, VideoProc is a one-stop video downloader, converter, editor, and recorder for Windows (10) and Mac with Level-3 Hardware Acceleration support. Want to download and convert YouTube to MP3 in a totally free and safe way? Now, you can make it with the method here. The simplest way to convert YouTube video to audio free online, extract movie soundtrack into MP3, AAC, WAV, etc, and convert music video to audio on computer. Easy YouTube MP3 downloader plugin/add-on for Firefox is recommended to you, makes your YouTube MP3 downloading progress quick and simplified!